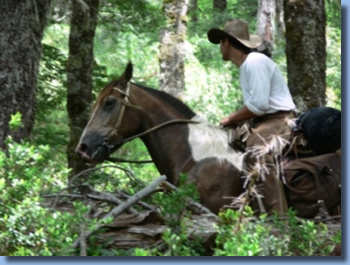 The trail is guided by an Chilean arriero (as the Chilean cowboys are called) and an English and Spanish speaking guide. We sleep in tents, all our luggage we take with us on the horses. Cooking, putting up the tents etc., will be done together by the group. Everyone should to their own ability, take care of their own horses. This pack trip leads us to some unique and amazing landscapes: from dense rainforest to sandy, desert like high mountain areas to swampy high planes and over snow covered passes. This is a ever changing landscape, almost impossible to catch it in photos, you turn around a corner, cross a pass and you see one mountain ridge behind another, covered with the immense rainforests of the northern Patagonia. This landscape to is fragile, plants grow extremely slow in these heights of the Patagonian Andes, ecological systems are very fragile, and should not be interfered or altered by e.g. bringing in other species. 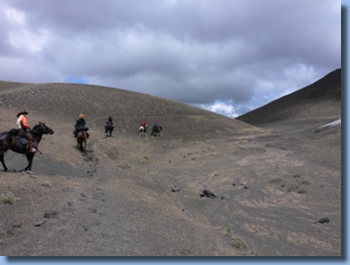 On these trail rides we work closely with the administration of this part of the National Park in order to establish rules and regulations which allow us to do this ride minimizing the possible damage. 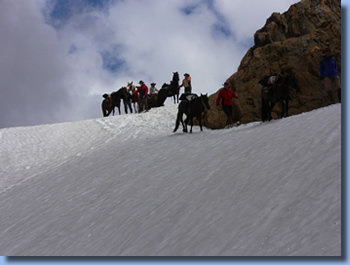 For that reason the number of excursions as well as the number of riders per tour is limited. 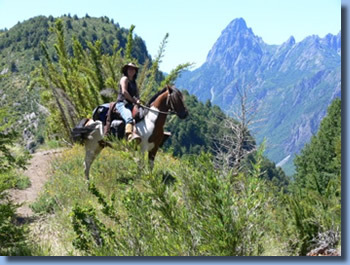 We pick you up in Pucon at 9.00 am, have breakfast, and then take off for an initial 3-4 hours ride crossing the Mapuche Indian Community Quelhue, decide which horse matches with which rider and which horses we will take with us. 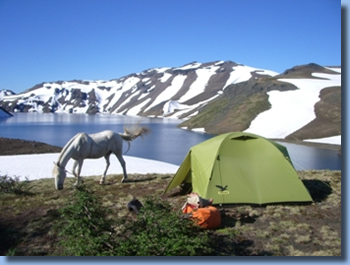 Either this evening or the next morning we move to our Villarrica base camp at "Paraiso Escondido" Valley. 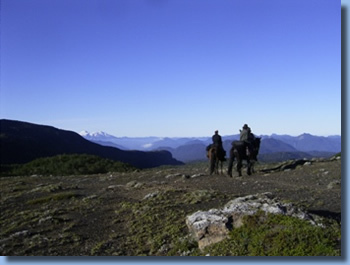 We enter Villarrica National Park by riding through dense forest, but after gaining elevation we leave the woods and arrive to a hilly area populated by lower vegetation and bushes. Around noon we reach the the dramatic lava and snow fields in the shadow of volcano Quetrupillan. This is the kingdom of the condor and there is a good possibility we will meet one of these giant birds. About 3 hours later we arrive to Laguna Azul, a deep, blue lake, where we will set up the tents on the edge of the forest overlooking the lake. From Laguna Azul we head towards Laguna Blanca, crossing a huge field of volcanic stones and riding around an ancient side-crater of Quetrupillan. After we arrive to the flat, black beach of Laguna Blanca, the landscape changes to a desert-like area with volcanic lava sand, interrupted by fields of snow. 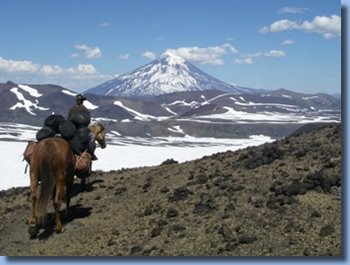 We ride on towards Laguna los Patos, with the mammoth volcano Lanin ever-growing in the distance, and return to our camp at Laguna Azul in the evening. 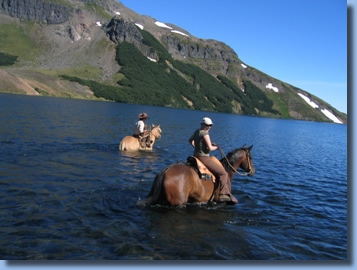 Leaving Laguna Azul, we ride back to the "Paraiso Escondido” valley and in the evening a Chilean Barbecue, "al Palo" and "choripan," is waiting for us at the Farm. Returning to Pucón after dinner. You may opt for another night at the ranch if you'd like. 4 days, 3 nights, 4 days on horseback. 1 night in double in guest-house on the farm, 2 nights in tent camps. In the tent camps 2 riders share one tent. We always try to match adequate persons and try to give solo travelers a single tent. Because of weight issues this will not always be possible. 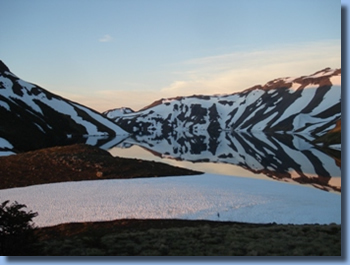 on the 2. and 3.day the camp is beside a clear mountain lake. Complete food and soft drinks from dinner on the first day to the farewell BBQ on the last day. On the trail we have breakfast, a snack at midday and dinner at the campfire. All transports to and from Pucón, all fees, all equipment from spoon to tent and sleeping mats. Enjoy a documentary filmed by German National TV about our expedition to Sollipulli Volcano, our Chile - Argentina ride and life on our ranch. Enjoy some impressions of our horses: the morning on the paddock, out riding and finishing the evening on their mountain pasture. A video by our guide Lotte. We are proud winners of the 2015, 2016 and 2017 Trip Advisor Excellence Award. Thanks for arranging that fantastic ride for us, it truly was a trip of a lifetime. It has been one of the best experiences of my life, and I will certainly be returning some time. Antilco is registered with the national Tourism ministry. © 1998-2019 Antilco Ltda. All Rights Reserved. Based on a template by ShapeBootstrap.